"Does anyone in all of HHS/CMS understand the meaning of being "proactive"?" First I’d like to thank you for taking my telephone call the other week and for your recent letter (attached). I’d also like to apologize for my previous misspellings of your name as apparently I did not hear it clearly in our conversation. ml. This will provide you information and instructions on that process. Once again I wish to reiterate that when I proactively embarked some two (2) years ago on my advocacy/activism to correct the egregious and morally wrong ineptitude perpetrated against these VNS depression patients by the oversight for medical care in the May 7, 2007 decision I started out by requesting “Compassionate Use” from the former and present Secretary of Health and Human Services for these patients. As time progressed and no such document was forthcoming I learned of other decisions rendered by the judicial entity of CMS. 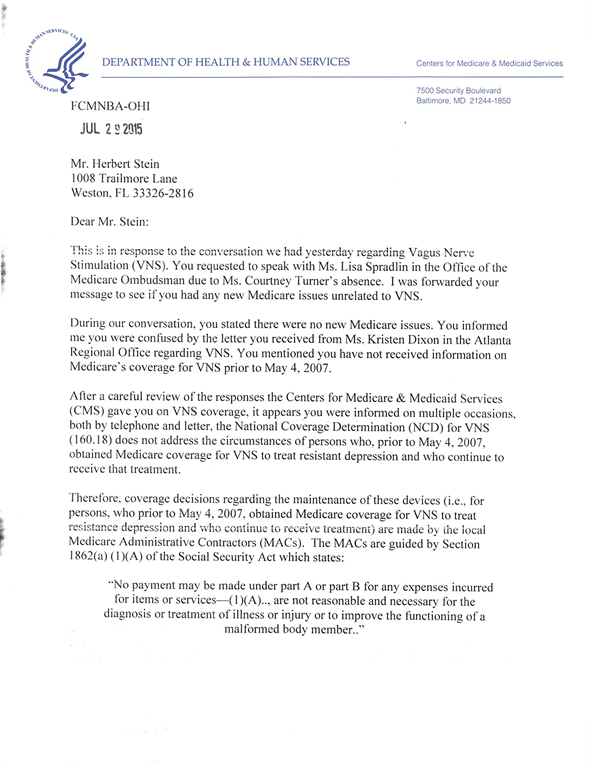 The essence of these documents is the doctrine of “Continuity of Care” and more specifically as it relates to VNS depression patients implanted prior to May 4, 2007. Therefore that decision does not apply to these VNS patients for whom I advocate. Is that too difficult for all to comprehend. The point of all my communications is the obvious lack of “proactive” actions on the part of HHS/CMS with the exception of Jonathan Blum, Amy Larrick and Courtney Turner. The fact is no one discusses any of the decisions listed above and no one has indicated to me in all the communications I’ve had, including yours, that these decisions have been sent to MAC, Regional Offices, State Agencies and/or Contractors etc. to read, understand and acknowledge. If so, this would eliminate the need for any denial or question in MAC’s and/or other agencies decision making process and eliminates the need for the patient to appeal a MAC and/or other agency denial. Yes, I understand your letter all too clearly only you too continue the negativism, roadblocks and need to challenge these patients instead of really helping them. Apparently what many of you folks cannot fathom or understand is the fact these patients are often physically and mentally unable to care for themselves let alone advocate for themselves especially when in the throw of severe depression. All do not have “Herb” to battle the bureaucracy’s constant Tower of Babel or what I also refer to as “Bureaucratic Speak”. Does anyone in all of HHS/CMS understand the meaning of being “proactive”? The information to help these patients is on record. It is not there to challenge them or be omitted from all communications. 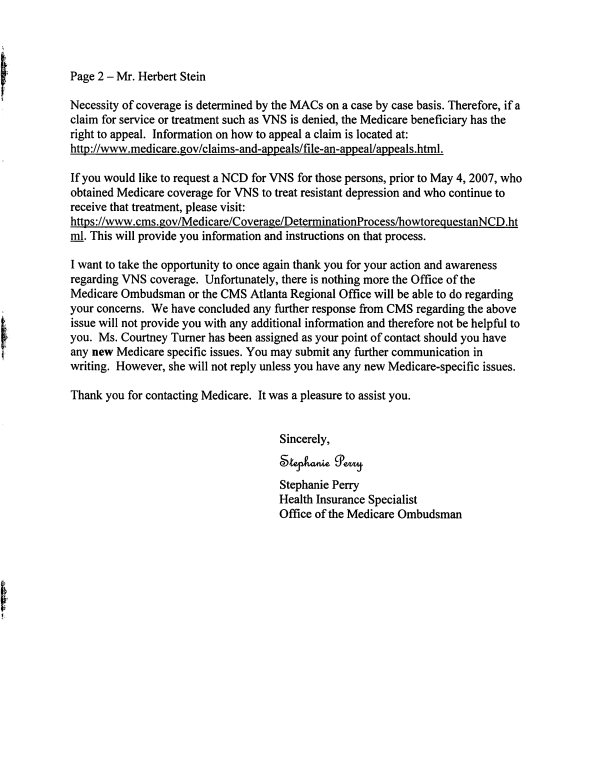 So how about someone in authority finally getting back to me after all this time telling me that all the decision makers within your voluminous bureaucracy acknowledges the additional information pertaining to these VNS depression patients instead of rehashing that same old egregious May 4, 2007 document which does not apply to this patient group? Disclaimer: This E-Mail is covered by the Electronic Communications Privacy Act, 18 U.S.C. §§ 2510-2521 and is legally privileged. The information contained in this E-Mail is intended only for use of the individual or entity named above. If the reader of this message is not the intended recipient, or the employee or agent responsible for delivering it to the intended recipient, you are hereby notified that any dissemination, distribution, or copying of this communication is strictly prohibited. If you receive this E-Mail in error, please notify the sender immediately at the email address and/or phone number above and delete the information from your computer. Please do not copy or use it for any purpose nor disclose its contents to any other person. CONFIDENTIALITY NOTICE: This e-mail message including attachments, if any, is intended only for the person or entity to which it is addressed and may contain confidential and/or privileged material. Any unauthorized review, use, disclosure or distribution is prohibited. If you are not the intended recipient, please contact the sender by reply e-mail, destroy all copies of the original message, and do not disseminate it further. If you are the intended recipient but do not wish to receive communications through this medium, please advise the sender immediately. This entry was posted in VNS Therapy and tagged Centers for Medicare and Medicaid Services, CMS, Cyberonics, depression, Health and Human Services, HHS, major depressive disorder, Vagus Nerve Stimulation, VNS, VNS Therapy. Bookmark the permalink.